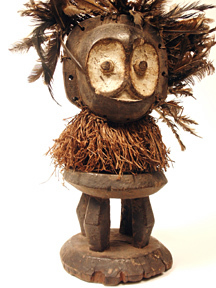 A rare mishi anthropomorphic figure of the Bassikassingo people. 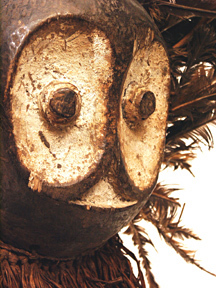 A janus mask  reminiscent of the style used by the Kalunga Society of their Bembe neighbors  is connected by a fiber-collared neck to a spherical four-legged stool similar to a design used by the Lega Bwami Society. A half circle of feathers crests the head. The figure represents the grandson of a primordial ancestress who was an important dancer of the kalunga mask. It is an important example of an artistic synthesis of historically different, but territorially coexistent peoples in the East Kivu region of the D.R.C. Wood, plant fiber, feathers, white pigment.